Downtown Port-au-Prince appears after the recent earthquake. Here's what's on the ground in the debris of the Haitian earthquake: on Rue Pavee, downtown, an empty can of motor oil, some black piping, a turned dowel, empty blue medicine bottles, shards of ancient plywood, empty water bags, and a crushed brass candelabra. Then, after a turn onto Grande Rue ("This was the Wall Street of Haiti," says Franco Petruzzelli, an Italian businessman who is watching his hardware store across the street) there are O rings of all sizes, scattered blue fan guards, old computers, a box for an Oster blender, orange peels. Broom heads and eyeglass frames dot the hills of strewn brick and cement block. Petruzzelli has hired four security guards to ward off opportunistic salvagers; and, yesterday, Petruzzelli leased a warehouse at the edge of town where he's going to send all his stuff. Continuing on, looking down, there is so much that is now useless: cracked egg cartons, single shoes, a broken satellite dish. There are smashed cars and trucks, and a score of crushed motorcyles lying one on top of the other. Then a right onto rue du Docteur Martelley Seide and there are metal doors, file cabinets, a dentist's chair turned upside down, a padlock, an MRI of broken vertebrae, and a stiff brown leather glove reaching out of a pile of wreckage. Upon closer inspection, the glove is a human hand in rigor mortis, dotted with flies. The flesh is ripping open in little tears. Right next to it lies a long femur, broken at the knee, with flesh still adhering to it along the bone. That's what's on the ground. Look up, look around, and it's Dresden 1945. The stench of death is sporadic now in Port-au-Prince, but still strong. "Crush victims start to decompose sooner than normal corpses," says Cyril Pressoir, owner of a touring business up in Petionville. Pressoir became an instant expert in decomposition on January 12, when he spent two days trying to pull neighbors from the debris. "The skin opens up and the insides fall out and the guts are immediately exposed to rot," he says. Pressoir used a flashlight to locate the bodies of the legendary Haitian geographer Georges Anglade and his wife. The bodies couldn't be pulled out from under the roof of the house, so the couple were given Christian burial right there in the ruins. At my hotel there's no electricity and right now, no water. 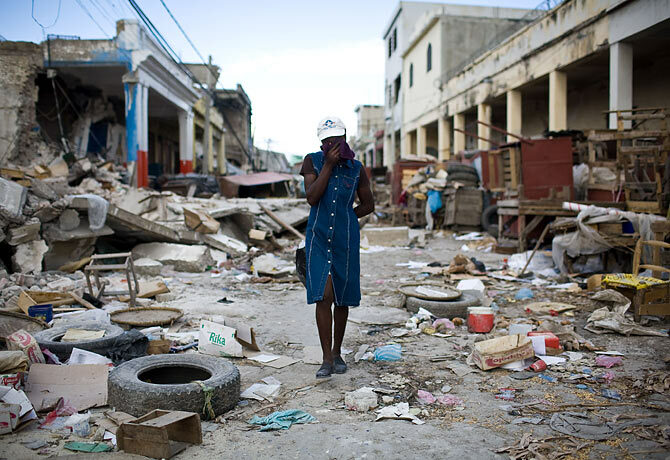 Usually journalists cover Haitian misery but don't have to share in any of it. But now, we're sleeping outside, like the Haitians. Most of us, like the Haitians, don't have tents. Our toilets are full. The main staple at the hotel is spaghetti with red sauce, which I've never seen more of, even in Italy. Spaghetti in the hotels, spaghetti with red sauce and a little bit of meat for dinner with the former prime minister, spaghetti with a ketchup and mayonnaise sauce in a new shantytown in Leogane. At night, the foreign media are using candles and flashlights, just like the Haitians. It gives us for once a taste of what the Haitains' lives must be like. But there are several big differences between us and the people we're covering. We have jobs, and enough spaghetti to fill our stomachs, unlike the Haitians. And none of us has just lost a quarter to two-thirds of his or her family and close acquaintances; none of us has just lost a house or a business or both. None of us is actually homeless. We're not at our wits' end (though we may sometimes feel that way). If you talk long enough with just about any Haitian  from the president to a former mayor of Port-au-Prince, to a well-off art collector, to Cyril Pressoir, to the security guard (with a wife and a three year old) who's getting paid $40 a month to guard a block of wreckage downtown  you'll see tears start up in their eyes. This is a country in shellshock. Everyone needs something here now  first of all food. But aid distributions are complicated. People arrive at a distribution site not knowing what they'll get. They expect food  which to a Haitian means a biggish plate of beans and rice that includes sauce from the beans. It's often called national rice. However, sometimes people line up  often for hours in the very hot sun  only to discover that they're being given delivery kits for pregnant mothers, or hygiene kits with toothbrushes and soap. It can be disappointing for a mother of five to receive a razor and bandage for the umbilical cord when she has five mouths to feed. Or to be handed toothbrushes when you were expecting your first meal in two days. It's hard to determine how to remedy this situation other than to give food no matter what else is being handed out. But funny reactions still happen, ones that make me, at least, marvel at the resiliency and (sometimes excessive) dignity of Haitians in the sorest straights. A guy named Fritz was waiting for food distribution near the Place Jeremie in town. "You look hungry," a friend said to him. "I am," Fritz said. "So go get some food," the friend advised. Fritz shook his head. "What?" said the friend, astonished. "Why not?" "Paske," Fritz said in Creole. "Li pa gen sos." Because it doesn't have sauce. Today, a bay manje, or food distribution, by the Haitian government went awry for lack of good security. There were about 10 Haitian policemen present and 4,000 hungry people. People lined up near the wrecked presidential palace, then grew impatient, then panicked and ran. There was a stampede. The lesson: cooperation, coordination. Haitians have to work with foreign security forces in this catastrophe and vice versa. The Haitian government knows its people but doesn't command enough respect right now to control them. It also underestimates their desperation and need. Nor is that government in top form. The quake caused an instant brain drain. The people in government who were at work a few minutes to five on a Tuesday evening, when the quake struck, were those who were the most dedicated to the country, the most professional, the most serious. Their offices tumbled down on them, and that irreplaceable brain power and engagement was lost. Thus the sending of 10 cops to a huge gathering. The foreign forces in Haiti now have the strength of firepower and efficiency behind them. But they don't know the country well enough to behave with infallible courtesy or even intelligence. Cooperate, coordinate. One special thing about today's sloppy, panicky bay manje, though. Not a shot was fired. In the old days before Haiti began its experiment with democracy, there would have been at least a dozen dead. Equally important, no one today  not even young men wielding guns  wants to add to the long list of the earthquake's victims. A bulldozer is removing rubble from a street down below the terrace where I am writing this on my iPhone because Internet service is more than sketchy. The awful smell of death and decomposition is seeping out and up in waves. At another table, missionaries are practicing their French. Somehow, their presence reminds me that John Travolta sent in a plane load of relief and Scientology "mission volunteers," possibly not what a doctor would have ordered at this moment. Julio Iglesias returned from the shadows to pay a brief visit in solidarity with the Haitian people and the president of Haiti took time out to welcome him. Iglesias promised to build a school and I will be waiting for its opening over the next decade or so. Given the unconscionable destruction this earthquake has wrought in a country that was already in many ways shattered, every response must be meaningful and organized, and from its very inception, serious. The survival of a nation lies in the balance.